The beautiful hardwood pattern is the focal point of RoomSmart’s Nordi Collection, and the versatility of all the available matching pieces in this collection is a designer’s dream come true! This is streamlined contemporary Nordic furniture, beautiful in its simplicity. The veneer is finger-jointed oak that creates a mosaic of pattern throughout the finish. The veneer finishes by ArteMob, the designer/manufacturer of this collection, are premium-quality, and resistant to scratches, dents, nicks, water rings, and stains. The pieces in this collection are mainly for use in the living room and dining room, although many could be used throughout the home. It’s easy to arrange your house, apartment, condo, or studio space with an open floor plan, with the different sizes and styles of the Nordi furniture. Space-saving and storage solutions are predominant in this collection, from the dining table with built-in extensions, to the variety of wall cabinets, sideboards, entertainment center, and coffee table. There’s absolutely no reason that everything can’t have its place, with the shelves, drawers, and cabinets available with this collection! SCANDINAVIAN MODERN DESIGN: Simple lines, straight table legs, and natural woodgrain finish, give this dining table an elegant Scandinavian look that is perfect with most modern home décor styles. FINGER-JOINTED OAK VENEER FINISH: Oak veneer finish, in varied shades of oak woodgrain, are joined toge..
SCANDINAVIAN SIMPLICITY: Simple lines, beautiful woodgrains, and a natural mosaic of pattern give this chest an aesthetic beauty that will be the focal point of your home décor.FINGER-JOINTED OAK VENEER: Solid oak is laminated with a finger-jointed oak veneer, mixing variant shades of oak to create .. CONTEMPORARY DINING BUFFET STYLE: Combination of cabinets and drawers is the perfect storage space for your dining room china, fine silverware, wine glasses, candles and more!WIDE INNER SHELVES: Cabinet doors open to reveal wide, deep shelves that will hold everything you need for your dining room!T..
SCANDINAVIAN CONTEMPORARY DESIGN: Sleek, simple lines, beautiful woodgrain finish, and neutral oak color add up to furniture that is soothing and that blends easily with most home décor styles.FINGER-JOINTED OAK VENEER: The Nordi collection is laminated with intricate finger-jointed oak veneer, with..
MODERN SCANDINAVIAN STYLE: Clean, crisp lines, natural woodgrain finishes, and practical function are the signature of modern Scandinavian style. The Nordi display cabinet will add a beautiful focal point to your living or dining area! CABINET STORAGE SPACE: Two lower cabinets with shelves offer lot.. 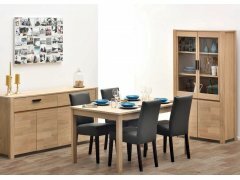 SIMPLICITY AND STYLE: Aesthetically beautiful in design, with sleek, simple lines, slim contrasting metal hardware, superb neutral color pattern, and practical storage function.PREMIUM QUALITY OAK VENEER: Solid oak furniture has been laminated with finger-jointed oak finish that provides durable pro..